Paccar Parts Australia has a treat at this year’s Brisbane Truck Show for those aiming to design their prospective Kenworth T610 SAR to suit their needs, and eve for those who just admire the brand. Along with Kenworth, DAF, Paccar Genuine, TRP and multiple vendor brand parts, its Paccar World stand will give visitors and prospective clients the opportunity to customize their own "virtual" T610 SAR in real-time using the Paccar Parts T610 SAR Accessories configurator. "We’ve assembled and rendered the original CAD drawings of the T610 SAR to create an interactive experience for Kenworth fans and owners," Paccar Parts marketing manager Anthony Kwan says. "The final result is a T610 Accessory configurator that allows you to pick your cab option, colour your truck and fit it out with all the latest chrome accessories currently available through Paccar Parts." Customers will be able to share their custom-designed truck with your friends via social media, and email themselves a copy. 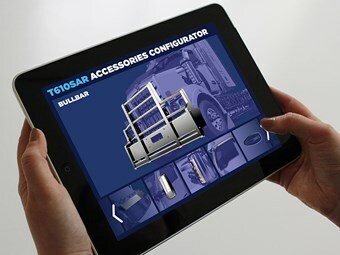 The Accessories configurator will be on display adjacent to the Paccar Parts booth at Paccar World. The stand will also showcase a selection of products from TRP, designed for all makes of trucks and trailers with a focus on American and European drivelines. The TRP range guide will also be available for attendees to see the entire TRP parts range. As an added benefit to those with used Kenworth trucks, Paccar Parts has created a Register Your Rig program that gives them the opportunity to register their details with Paccar Parts, with a limited edition gift those who sign up on the day.